CARBONDALE, Ill. – A law student at Southern Illinois University Carbondale is just one of nine students from law schools across the country selected for the American Bar Association's Judicial Clerkship Program. Ashley Moya recently learned that she will participate in the eight-week judicial internship with Christine Ward, a civil court judge with the Fifth Judicial District of Pennsylvania in Pittsburgh. The internship begins in June. This is the first time a student from the SIU School of Law has been selected for the program. Moya is a first-generation U.S. citizen from Honduras; her family, including mother, Ligia, lives in Miami. Moya graduated from Stetson University in DeLand, Fla., with a degree in International Studies. She was persuaded to come to the SIU School of Law by Paula Basler, the law school’s director of alumni affairs, whom Moya met with while Basler was on a recruiting trip. She is interested in pursuing business law but volunteerism is also a priority for her. In addition to her part-time job with the Carbondale law firm Gilbert, Huffman, Prosser, Hewson & Barke, Ltd., Moya mentors children in the afterschool Jump Program at Carbondale Middle School, and assists the law school’s Immigration Detention Project that visits the Pulaski County Detention Center in Ullin. She is also president of the law school’s Hispanic Law Students Association, a registered student organization on campus. As an example, Moya’s typical Tuesday schedule can look like: 11:25 a.m. to 12:15 p.m. class, 1-3:40 p.m. work; from 3:45 to 6 p.m. volunteering at the middle school, and class from 6:30 to 9 p.m. She readily admits she needs a planner to keep track of everything she has to do. Moya said she interned last summer in Miami for a civil court judge and on her first day got to watch a civil trial involving boxing legend-now promoter Oscar De La Hoya. While she is interested in business law, Moya said she also likes criminal law. But, Moya agreed, she is driven to succeed. She didn’t take a break between earning her bachelor’s degree and attending law school. During her last year at Stetson University, Moya said she worked two jobs to pay for tuition and had an internship at a courthouse in Florida. Basler recalls when she met Moya she was shy, and Basler did not know whether Moya would move more than 1,100 miles and 15-and-one-half hours away from home. 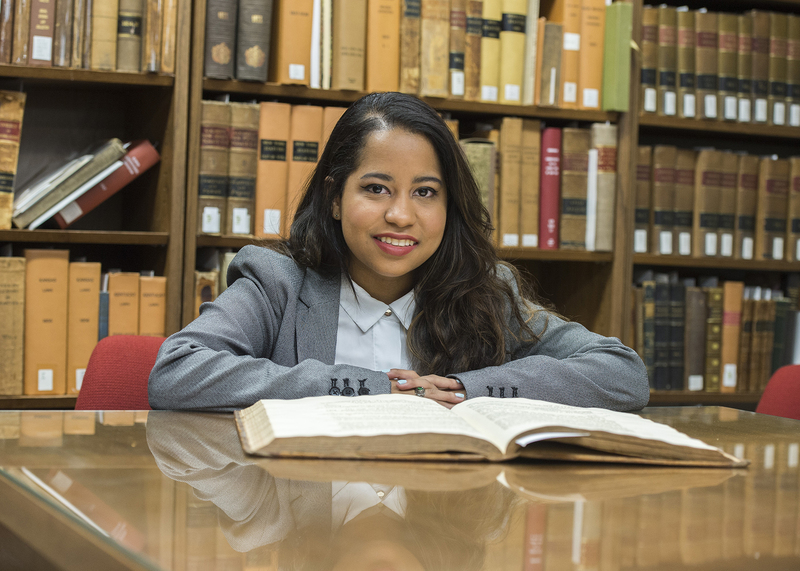 Upon seeing Moya for law school orientation in August 2015, Basler, who is Colombian, helped Moya with moving and settling into very different surroundings. Moya has an “inner drive” that continues to grow, Basler said. “I think every little step of the accomplishments she makes fuels that drive. Every time she achieves a goal she gets involved in other activities,” Basler said.